I hope your gifts are all bought and wrapped, your cookies are baked, your guest rooms full, your heart is filled with the love of God, and you are ready for a visit from Santa! 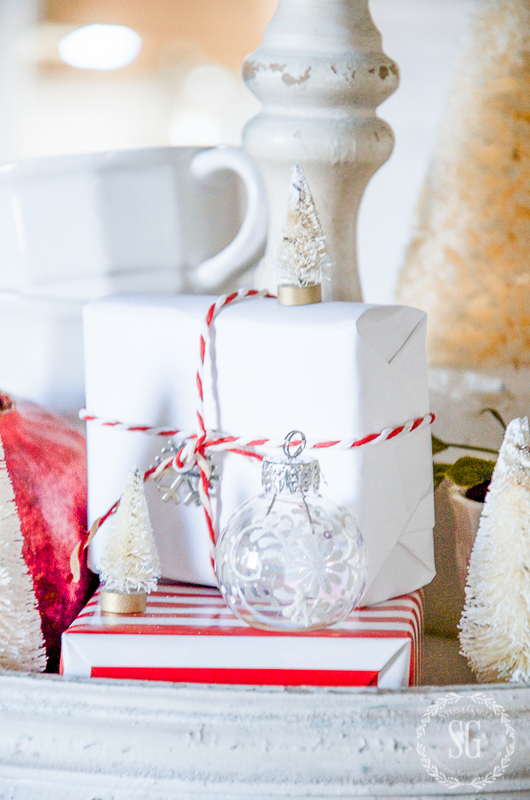 By now, most of us are winding down our Christmas preparations and beginning to celebrate! Here at StoneGable we are enjoying Christmas tree lights, Christmas cookies, and family! It’s time to relax and enjoy all our hard work with those we love! 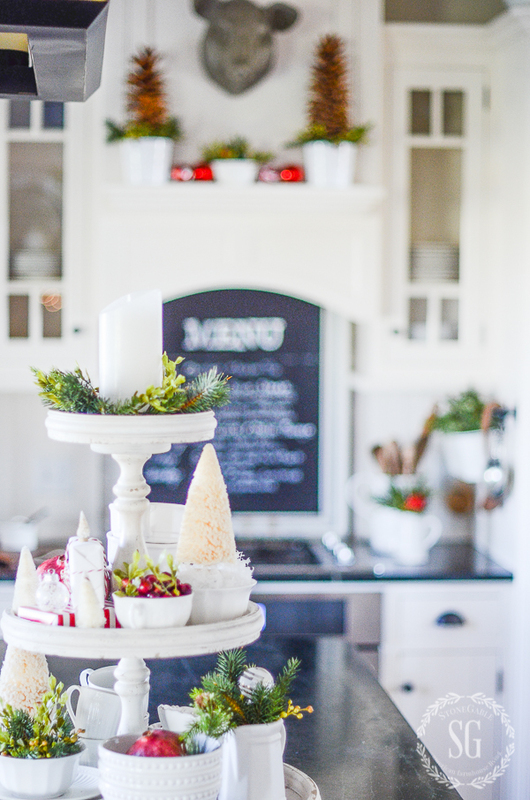 This post is not filled with tips or how-to-make-your-Christmas-easier! No recipes or house tours. Today, I’m just sharing some tree inspiration! Here’s a look at the trees of StoneGable! Hope your Christmas tree is Merry and Bright! I like all the pictures you took and I’m glad to see “snow” in several of them. I have snow that I bought last year and I forgot to use it on a couple of places that it will look good. Thank you. I always love looking at all the ideas that you provide. I love the tree on this blog. My tree is always traditional and I may use a few things on my tree that you have shown. I also love what you did in front of the fireplace. Your color scheme is wonderful…bright and cheery. Thanks for all your marvelous ideas. 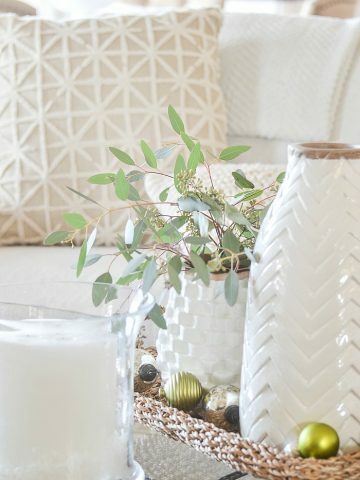 I work at Pottery Barn and show my clients this blog all the time. Thank you for spreading the word Trish! xo from StoneGable! Always interesting and always inspiring. 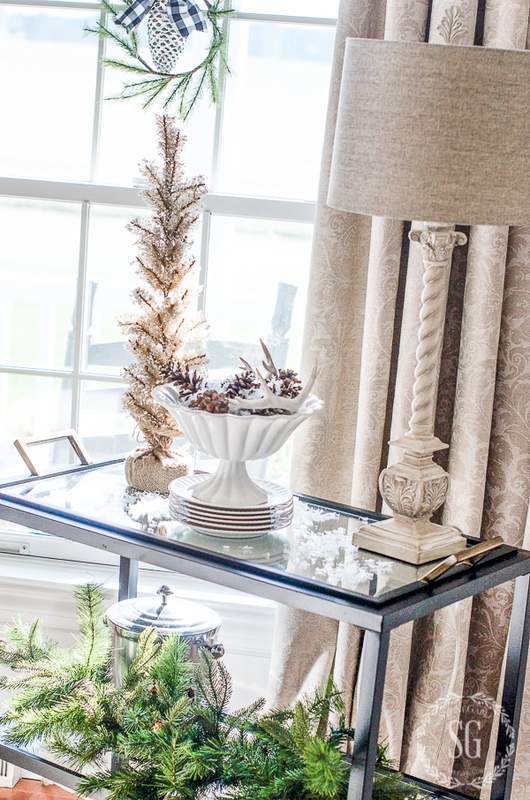 I love the way you think beyond the box when it comes to decor and your great vignettes. The shutters are back!! I love the mix of old and new in your home. Everything is so tastefully put together and the photography is stunning. 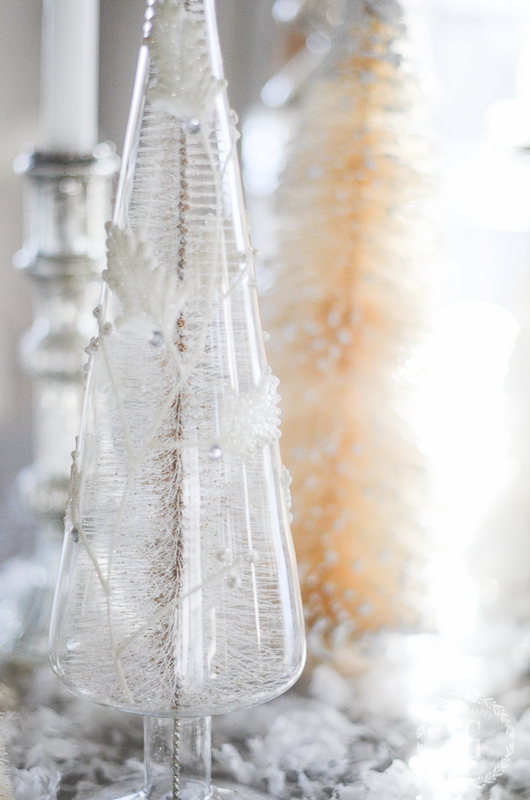 I used mercury glass last year and found ornaments on sale in Houston for 75% off!! I’m decorating my tree with trains this year so I will use my mercury glass in the dining room…I haven’t announced to my husband that we are getting a pencil tree 😉 Your trees are beautiful and so inspiring. Thanks for sharing your ideas and sweet words. 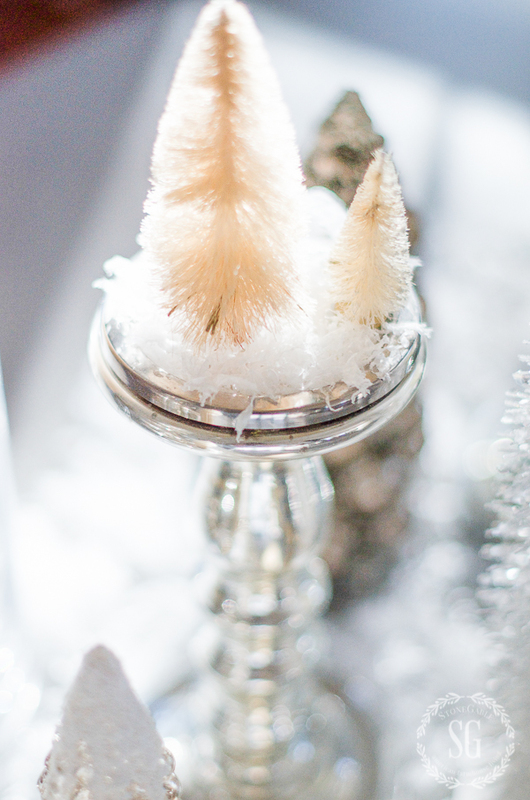 Love the little trees on the mantle in a white cup! 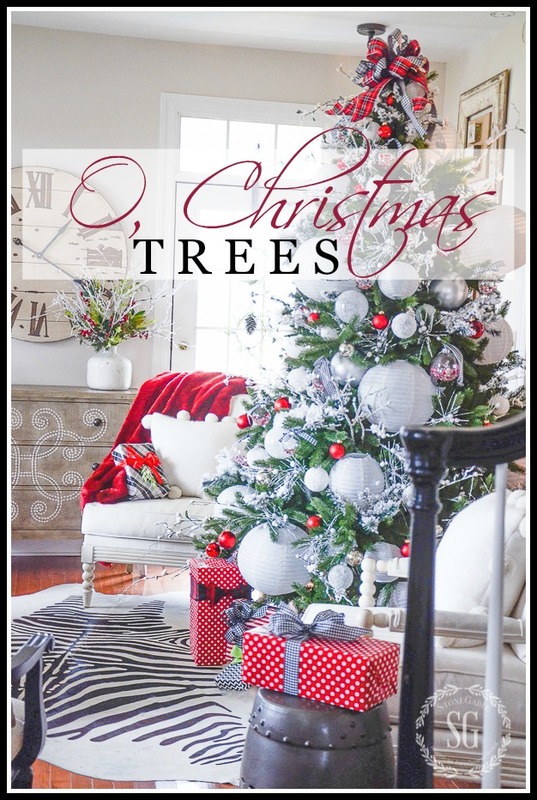 I love the way you have trees, large and small, all throughout your home! I love the white stars! I have never been a fan of mercury glass but your display has made me fall in love. Love it all!! I have never seen white lanterns on a tree–how beautiful!! Yvonne, you always surprise me and help me look at my own spaces with new eyes…and new possibilities!! We have a sofa table in our family room. Taking inspiration from you, Yvonne, I decorated the table with candles and trees. My color theme is white, silver and turquoise. I pulled out the turquoise and white quilt, now 52 years old, that my Grandmother hand quilted as our wedding gift and incorporated it with the decorations. I love using the old and new together. Thanks again for your blog. I look forward to reading it daily and all that you inspire us to do. Hope you and your family have a blessed Christmas. I’ve really enjoyed my subscription to StoneGable! 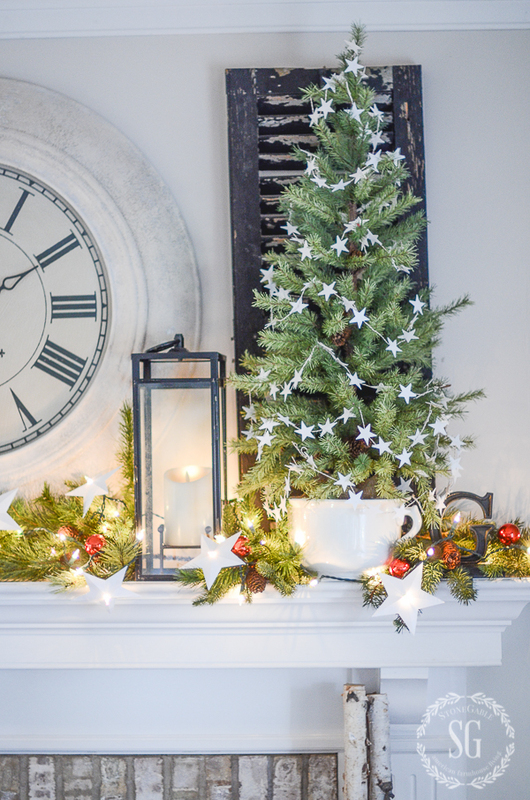 I really like that tree in a cup on the mantle, the star garland is a really pretty highlight. The tree in a cup is great and gave me a great idea for using a soup bowl that came damaged. The store insists on me returning the entire set rather than just replacing the one bowl ?. I think this will at least find a use for this misfit. Thank you again for sharing your home and ideas. See you were never meant to return them. I grew up taught that the dining room was the formal room of the house. I think your monochromatic look, using whites, creams, silver, is absolutely perfect! Absolutely beautiful trees everywhere. Love it! Going right now to dig out all those little trees and place them everywhere too. Many blessings for the Christmas season. LOVE ,LOVE , LOVE it all . I too have Christmas all over my house it’s so magical to sit and relax with just the tree lights on . I want to stay at your place !!!!! Thanks Tonya! Years ago I wanted to open StoneGable as a Bed and Breakfast. Do you have paper lanterns on your tree? Wow, I have never seen anything like this, but I LOVE it! 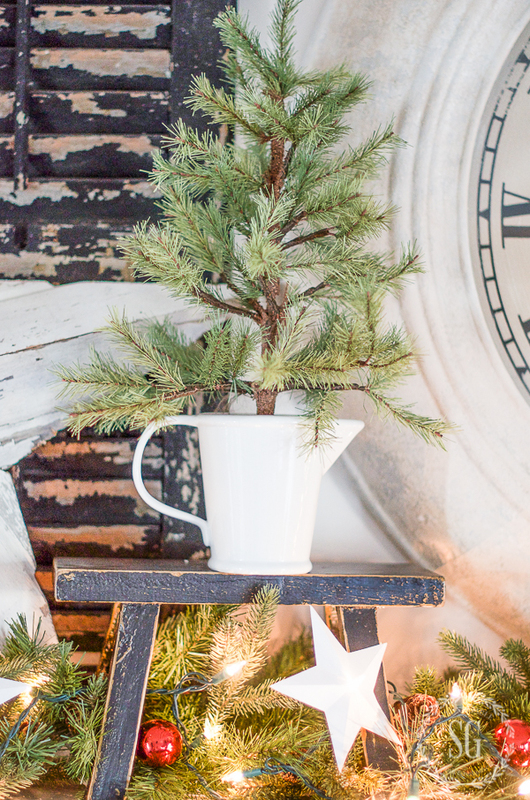 Yes, a very economical way to fill a tree with something pretty! Ugh I’m so jealous…you’re done and I haven’t even started decorating! We get occupancy of our new house on the 15th! I’m taking the rest of the year off from work and moving, decorating and unpacking! My Christmas tree will be done in the same colors as yours! I found some amazing deals last year at Hobby Lobby 90% off! Merry Christmas and thank you for all of your inspiration! Rebecca we moved into StoneGable on the 23rd of December many moons ago. And we had no kitchen at the time. Just relax, breathe and try to take the process in stride! Mainly celebrate Christmas the best way… in your heart! Oh Yvonne, I haven’t had time to do any Christmas decorating yet so I’m checking out your blog to see what you’re doing this year. You always have such gorgeous ideas tempered with doses of calm and practical know how. It’s Dec 4. I thought “I will get it done early this year”. The first thing I read is that you hope the shopping, decorations and wrapping is all finished by now! I wonder when you started! Yikes! Im checking in from a distant planet. Sending love and hugs from maybe maybe land. PS the captcha images are so small that I’m missing some. I don’t think I will be able to get many comments on here anymore. Hi Portia, not a race my friend! Just enjoy the process. As a blogger, I start very early, but before blogging, I always said, “I’ll be done by Christmas morning”! Love your pictures and your info!!! Classic, approachable, beauty or any decor…..love every vinyett. Thank you for your wonderful visual sense. ?
? Right back at you, Donna! What beautiful trees – can I come visit?? I love the back porch. I always just sit and look out the window when it snows. NOT THIS YEAR!! you have my wheels turning. Why not light a fire cozy up with blankets and hot choco. Thanks for a great idea. MERRY CHRISTMAS TO YOU AND YOUR FAMILY! Merry Christmas to you and your too, Teresa! Hugs from StoneGable! I love all your trees and home decorations – beautiful. For the past several years we set up our tree and set up a Christmas village scene under it. My hubby built a 4 tiered platform where we set the tree on the top with village pieces and then 3 more tiers to house everything. We enjoy it very much during the entire month of December! WOW! I want to visit your home! Love the white lanterns on the tree!!!! Great idea!!!!! Your home is lovely in it’s holiday garb! I look so forward to opening your posting every morning! Thank you for all the inspiration! Merry Christmas!!! All of it is lovely. I love the pop of red in your decor. Love all the trees! Simple but elegant! This is the post I go to for smiles! It’s my happy post! 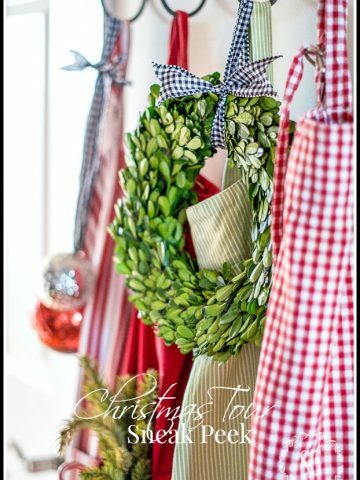 I love how you use alot of your regular household items to add greenery to to make Christmas!! Such lovely, tasteful and peaceful surroundings. I always love your home! So perfect, warm, and inviting. Can’t wait until we can see your Spring decorations? I have 4 or 5 green bottle brush Christmas trees (small) from my paternal Grandmother Lizzie. I just cherish them and love getting them out each year for the memories they hold. Christmas, with its colors, traditions, and family is such a wonderful time of year. Wishing you and your family all the happiness and blessings of the season! Love the idea of lanters on a Xmas tree. So smart Yvonne!!!! Everything is so beautiful. I’m already thinking about next Christmas. Thank you for the inspiration. Jennifer, google that. I bet there is a solution. Hello Yvonne…Your home looks beautiful and inviting! Can’t wait to see what 2017 brings! Happy New Year!! I always love all your decorations, especially the ones at Christmas time. Wishing you a wonderful Christmas time with your loved ones. Merry Christmas, Yvonne! The blessing of your new grandchild will make this one extra special! We have gone away for Christmas so I didn’t decorate this year. I am living vicariously through your decorations! Yvonne…you have outdone yourself with yr lovely collection of Bottle brush trees…Simply divine!!!! Have a Blessed Christmas with your family and Friends.Make sure you get a lot of help..hope you are feeling better. Thank you for welcoming us into your home and sharing your Christmas thoughts and inspiration with us. Your home is gorgeous and even more so at Christmas time . Wishing you a very Merry, Merry Christmas ! 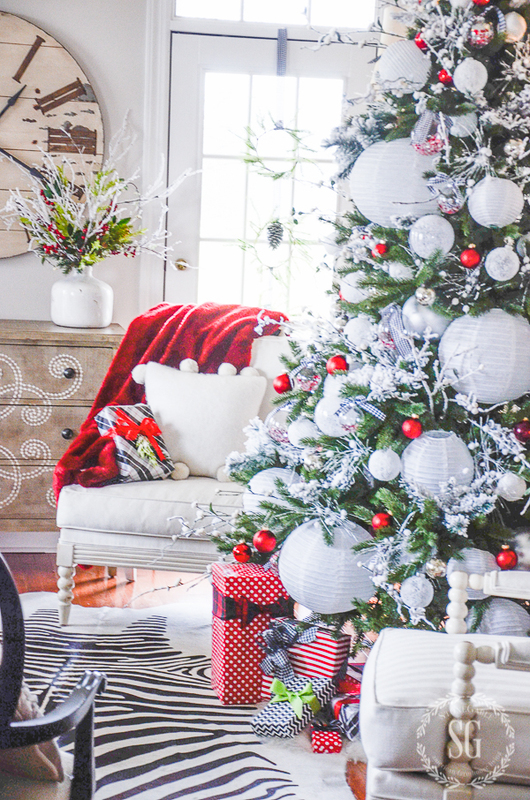 Love the beautiful trees, and all the different ways you use to decorate artistically! Merry Christmas! Love your wonderful enlighten blogg! Everything you do is just beautiful no matter the season. Would love to know where you found all your Christmas trees. Have you ever thought listing where items in your blogg might be purchased. That would be great for me and I’m sure other would love it also. Hope you and your family have a wonderful Christmas and blessed New Year! I love your dining room trees! So elegant! Yvonne~ you continue to inspire my decorating dreams! Wishing you and your family a very blessed and Merry Christmas. No my cookies are not all bakes, and the gifts are waiting to be wrapped. But the joy of Christmas and our saviors birth is ever present. Blessed Christmas to all. 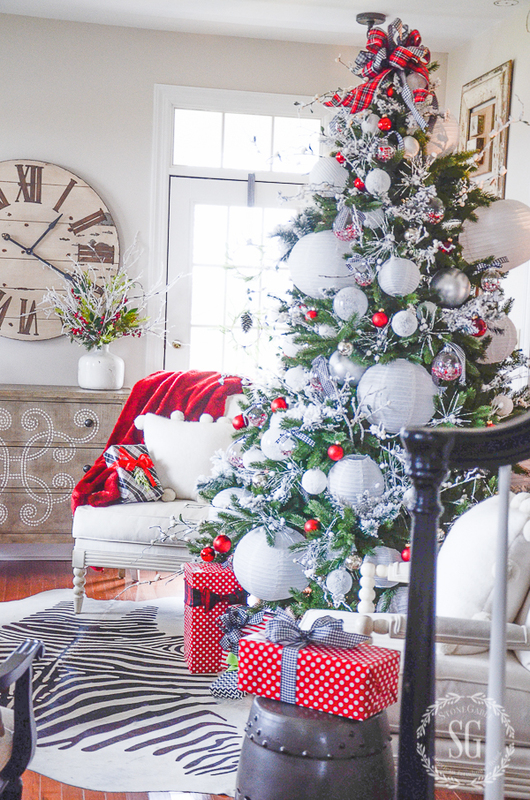 Love the creative tree displays through out your home! Love it all. More and more you help me realize how much I should focus on neutral furnishings and let color pull it all together. source for your gift wrap? Absolutely beautiful! May God bless you and your family during this Christmas season and throughout the coming year! Hi Yvonne! I just love everything about your posts! I love the colors you decorated with this year! Keep it up, you do a great job and give us so many great ideas and inspiration. Wishing you the very best this Christmas season and throughout the New Year! I love the star garland. Where did you get it? Everything is beautiful! I love the trees lining the center of you table. 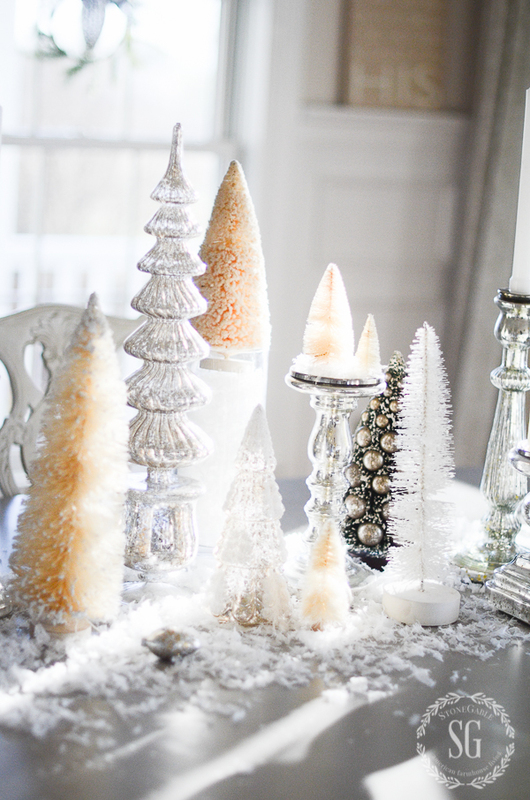 Love the silver, bottle brush and glass with brush trees. So simple and beautiful. All your trees are very pretty. Merry Christmas and God Bless you and yours. Your home is so magical. I especially love the white lantern tree. And to think you did all this with a bad ankle! Hope you enjoy your Christmas! Merry Christmas Yvonne! Best wished to you and your family. I know that you will! enjoy that new grandson! Love the dining room decorations..I recognize some of the trees! Have the same ones. I am having so much fun with trees this year, as well. Yours are delightful. When the grandchildren came, I challenged them to count the trees and whoever was the closest in number, would win a little prize. There are nearly 40, mainly small ones, tucked in vignettes and in groupings. Christmas blessings to you and yours. It all looks so beautiful and gives me some inspiration for next year. 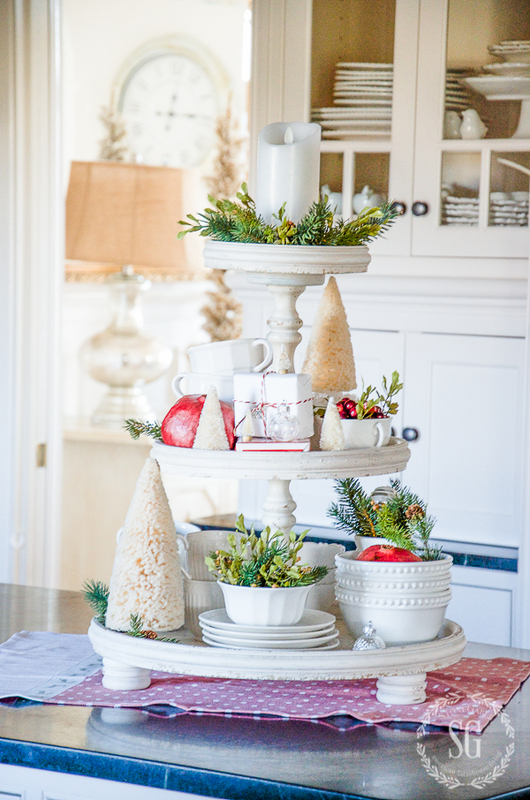 Love the dinning room table display! SO PRETTY, Yvonne! Hope you are enjoying your ‘relax’ time. You’ve done a wonderful job this season, sharing with all of us.. especially with a bum ankle! Your trees look beautiful! Your home is so stinkin gorgeous! I wish I had a fourth of the creative talent that you have. I have admired everything you’ve done for quite sometime, so I jumped on the Facebook bandwagon and just had to like your page! Beautiful! So glad you are joining our great facebook group! 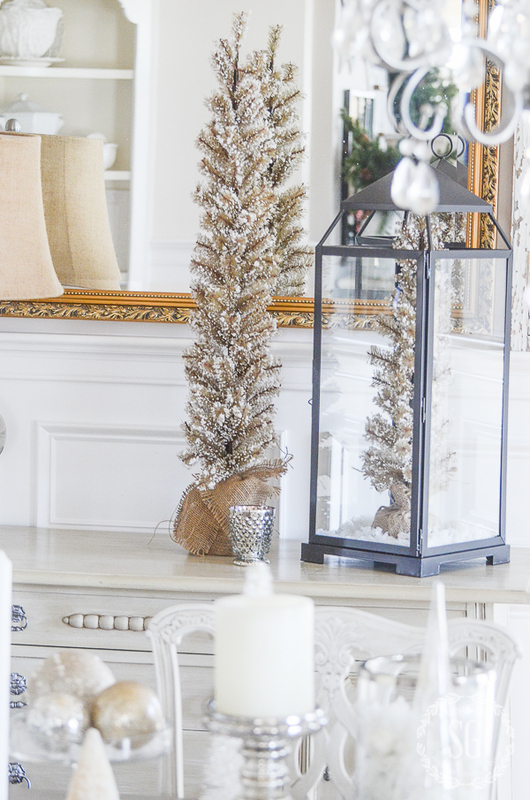 Your Christmas decor is beautiful! Great job! Enjoy and relax. Put that foot up! Merry Christmas to you & your family. Loving the Decorations! Merry Christmas! 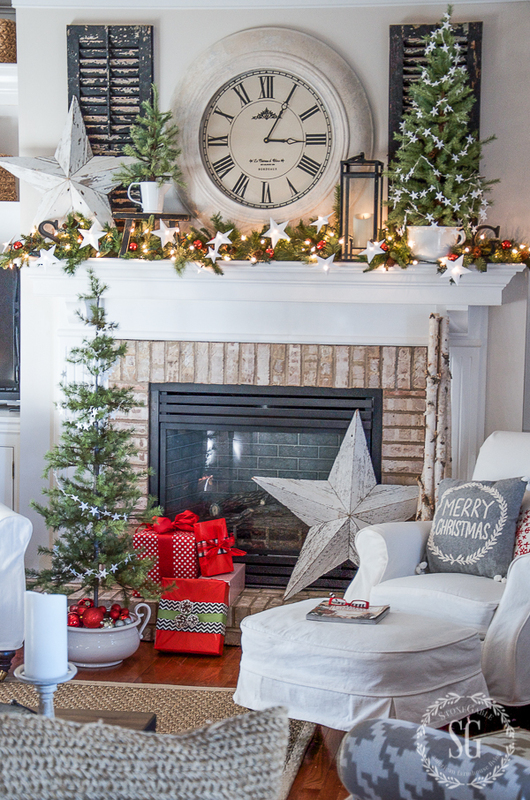 Thank you for sharing your home and all your holiday decorating tips. Merry Christmas! I always love your style!! I’d love to know where you found the three tiered thingy that you have the cups, bowls, etc on!! I found the small tiered one you use but I haven’t seen the other one. Thank you and Merry Christmas!! So sorry to ask; I see where you had already answered the same question above!! Lovely. A true inspiration! Tucking away some ideas for next Christmas!!! I love black for my home and wear too! Love the black and white check bows! 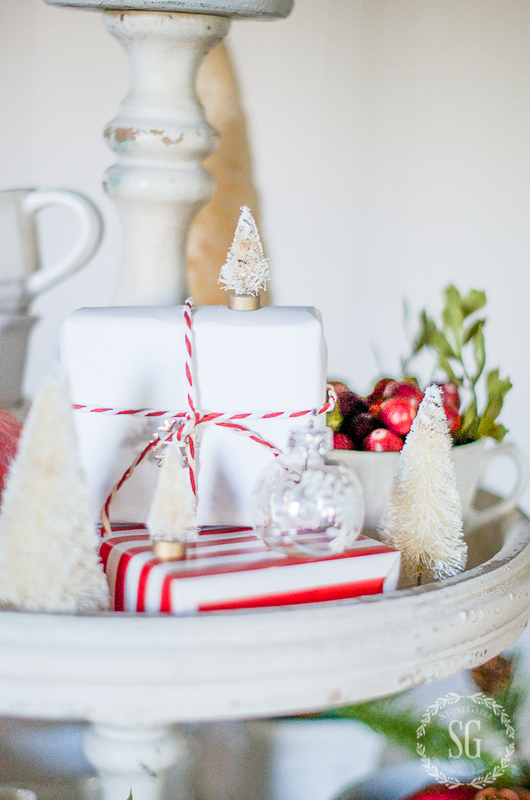 Have really enjoyed following your Xmas prep/planning/decorating blog this season. With your inspiration I have tweaked, rethought, and redesigned our family trove of decoration and ornaments. Of all that you have dazzled us with this time around, I am especially fond of the assortment of trees. Can you suggest some sources to find the brush trees and tinsel-y ones? Merry Christmas! Now get off that ankle and enjoy your family! So serene and peaceful. Merry Christmas and speedy recovery! It all looks wonderful! Enjoy your Christmas with the family home to make it special. I’m sure there will be magic in your house this year. 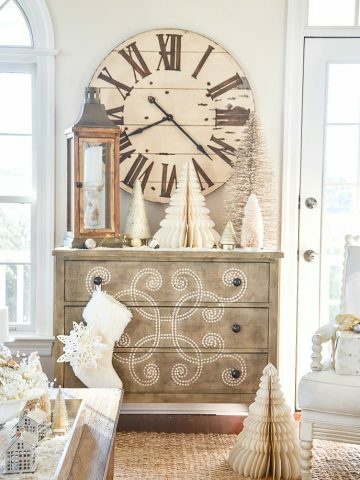 Love your beautiful style of decorating! I get new ideas every day from your blog. Thank you and merry Christmas! Lovely, lovely, lovely. You can’t have too many Christmas trees. I miss the days when we would cut down a live tree. It’s so disappointing that so many people don’t celebrate and revere Christ as He is our King. May you and your family have an amazing Christmas celebrating our Saviors birth! 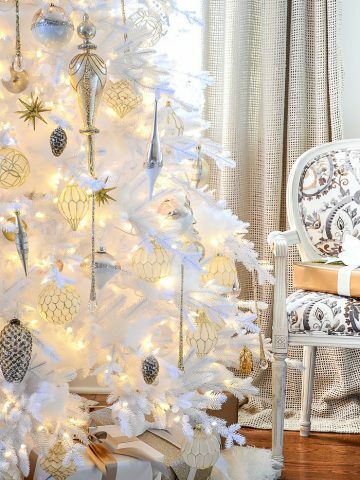 Your home is always so beautifully decorated for anytime of the year and I have so enjoyed your blog throughout 2016! Merry Christmas & an Awesome New Year!! Absolutely beautiful! The “star garland” is definitely on my “to do” list for next Christmas! Merry Christmas and best wishes for a wonderful 2017! Your trees are lovely and I enjoy your site so much. I especially love the christian stories you share and plan to go back and read them again in one sitting. In the midst of the Season of Santa the Reason for the Season gets lost in the shuffle. We are only a family of two and it can get lonely but Jesus is with us always and in all ways. 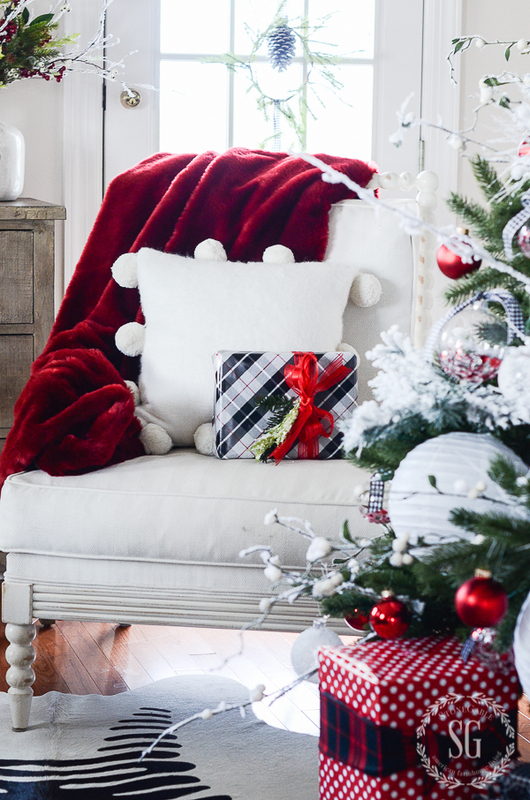 MERrY ChRistMas to you and yours… your home looks beautiful and so festive. 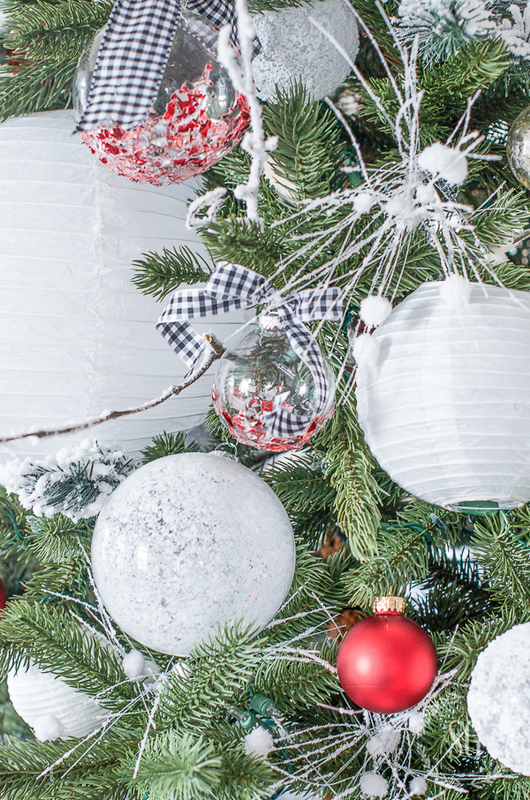 A good fiend is DECORATING her Christmas tree similar to yours… she is using the white lanterns. I can’t wait to see it. take care. ?Linda of No.Cal. So warm and welcoming, Yvonne…..beautifully done. Merry Christmas and best wishes for the new year. Lovely trees! 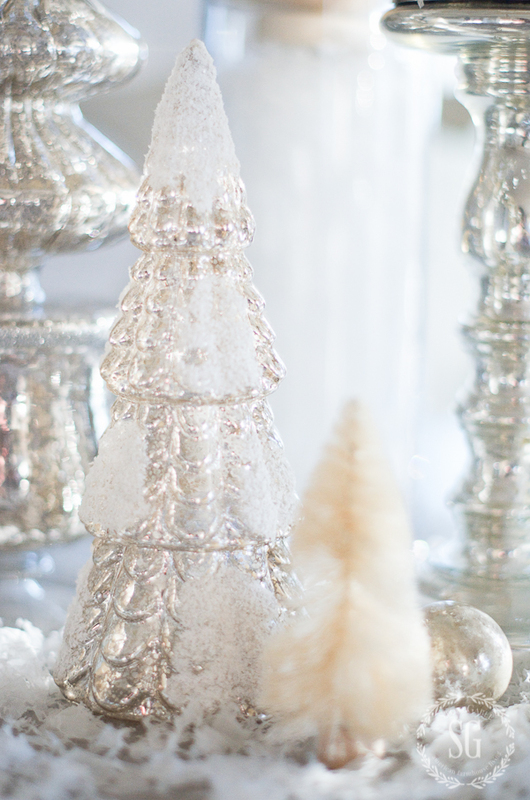 I adore Mercury glass trees…there is something so magical about them! Simply beautiful Everything you do is so carefully thought out and well decorated. ?Love your home ?Once again wishing you and your family a Merry Christmas. Andto you a speedy recovery???? I love your little trees placed all over your home! They are just so adorable and look as festive as your big tree. Merry Christmas to you and yours! God bless! Yvonne, you truly have a gift dear friend. Thank you for sharing your amazing talents with us. Love the little star garlands! 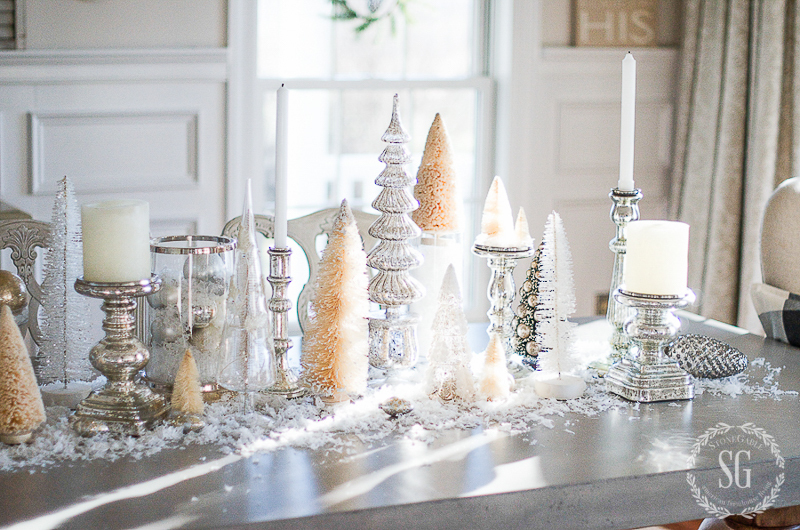 Love the silvery, gleaming dining room tablescape…simply gorgeous! Your home is beautiful and with all of your Christmas decorations, it’s magical!!! I’m curious as to when you take your decorations down after Christmas. Your home looks beautiful,Merry Christmas ! OK, now I have to ask… do y’all actually eat at the dining room table? It is so beautiful, has it been practical? Yet I know that if anyone can pull it off it is you!! 🙂 Thank you for ALL of your inspiring ways and words. Yes, we have already. I had 12 for our Christmas book club dinner. It’s been so easy to set everything around the centerpiece. I’m going to miss this Christmas centerpiece. Love the white. Looks beautiful. Merry Christmas, Yvonne! I hope you have a beautiful Christmas! Everything is so beautiful. I love your home everyday, but it’s really magical at Christmas. Hope you are doing well with your ankle and enjoying having your family with you. Merry Christmas ?. A winter wonderland, just breathtaking! Definitely on my “save” list. Too many beautiful ideas to try to remember. Thanks and Merry Christmas! Beautiful! Well done!! I love your style….Merry Christmas!!! Thank you so much Anne! Merry Christmas to you too! So lovely Yvonne. Do enjoy the beauty of your home with your loves and with that foot elevated. Everything is so pretty and looks complicated for me. I have arthritis very bad in my hands and cannot do so much details, but it is beautiful. All so lovely, but the dining room really catches my eye. The Mercury glass and white bottle brush trees look so lovely together. Hope you are on the mend. So glad you are home and surrounded by those you love. Love the Red and White beautiful.. I LOVE Stonegable! While I love my own home, I always love my visits to Yvonne’s place at Stonegable. It’s just wonderful and makes me happy! Merry Christmas Pratt Family! Everything is so beautiful. Merry Christmas! All so beautiful! I was wondering if you have a count total on your trees? No, but I should count them. Beautiful Job. Have a wonderful Holiday and a happy New Year. You are so creative, everything is gorgeous. Merry Christmas. Everything is beautiful! I hope you and your family have a wonderful Christmas! It is time to enjoy our efforts. Hope your healing is quick and painless. Oh, I also made your sugar cookies! Yum! Oh, I’m so happy you made them! Yvonne, I love everything you do! Where did you get your 3 tier wooden server? Thanks! Hi Jeanette, I got the server from a local shop. Sorry I don’t have a source for you! Such a beautiful home! Love all your trees. Have a blessed Christmas. Beautiful! All those trees make me smile! I love Mercury glass! Beautiful home! You are right. It is time to relax and enjoy the decorations and family and all the work preparing for the season. Your trees are beautiful and those bottle brush trees are so popular this year. enjoy! Just lovely! Merry Christmas to you and your family! Just Beautiful as usual, Merry Christmas to you and yours!!! Wishing you a speedy recovery!!! Wishing you and your family a Merry Christmas! Thank you for opening your home to us. I see that you have a ” thing” for Christmas trees, much like I have for reindeer. Beautiful! Merry Christmas and thank you for all the hard work and beautiful posts you give us everyday. Have been thinking about your little granson’s first Christmas and how happy your house will be this year. God bless everyone! So pretty, Yvonne! Get some rest and enjoy – Merry Christmas! What a magical home you have! Just stunning! Beautiful! Your home is an inspiration and something I look forward to seeing all the time. Best wishes for a wonderful Christmas! You have a beautiful home, Yvonne…Especially at Christmas! Your dining room table is stunning! I love Christmas lights at night. I can sit for hours gazing at the tree, reminiscing of Christmas past with my children and family. Before Christmas dinner,my older sister would read Luke 2:1-20,the birth of Jesus. After the scripture, we had a beautiful tradition of sharing of a thin, flat, tasteless wafer called oplatek. It is similar to the bread wafer used in Holy Communion. We would move around the room breaking bread with each family member, giving a kiss and a hug wishing them Merry Christmas. This to me, is the real meaning of Christmas. May you and your family hold on to your own traditions. A blessed Christmas, Yvonne! Thank you so much for sharing your Christmas traditions Nancie! How beautiful! 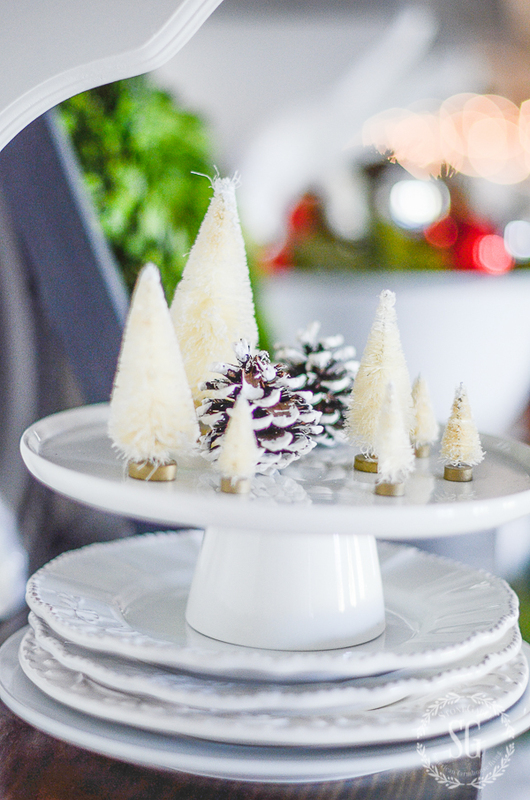 I really like the winter white tablescape as I love trees. I tried the bleached pine cones; they are so pretty. Plan to try some more! Merry Christmas and prayers for continued healing. Thank you for a wonderful blog! I get so many ideas from your blog. I love the bottlebrush trees. I’m going to make some this year. Have a wonderful day!! Oh, I would love to learn how to make bottle brush trees. Beautiful, beautiful Christmas trees. Thanks for sharing your home and your ideas for making our homes as inviting as yours. Merry Christmas! Loving all of the white stars! Simply stunning!!! Wishing u and yr family a very Merry Christmas and Happy New Year!!! Every gorgeous detail in place, lovely! Thank you for all the wonderful inspiration! Blessings to you and Stonegable! Very pretty! Your home is beautiful and attention to detail is amazing! I have enjoyed your blog so much this Christmas. I retired a little over a year ago from teaching and have finally had the time to decorate and enjoy this time of year. Thank you for all of your wonderful pictures and decorating tips. I hope you and your family enjoy a merry and blessed Christmas. Beautiful!! Hope you have a wonderful holiday. Merry Christmas, Beautiful decorating. Love the LR tree. What are the white “twiggis”? Maybe painted twigs from trees? I did that one year, but only had single twigs> Neat, whatever. Enjoy and hope you are recovering well. The twigs were bought. They have lots of flocking on them. I found them years ago on sale at a local shop. Lovely Christmas rooms…..the best to you. In your home during any holiday!! Peaceful and beautiful Christmas memories to your family! ? I will definitely be watching for after-Christmas bargains on trees! Beautiful tree, love red and white! Newly discovered blog, love it! Welcome to the StoneGable family, Dianne! 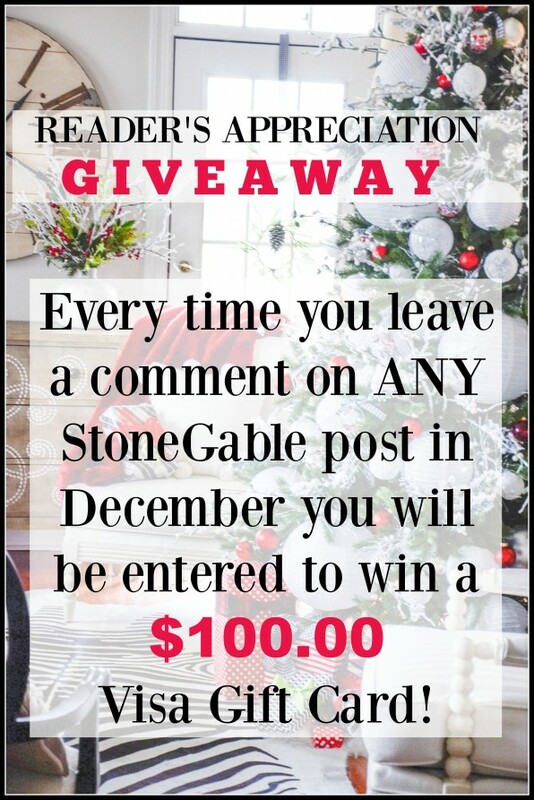 I want to spend Christmas at Stonegable! Beautiful! I am so impressed with your glistening dining room tablescape. A blessed Christmas to you and your family. Sending prayers for a speedy recovery.